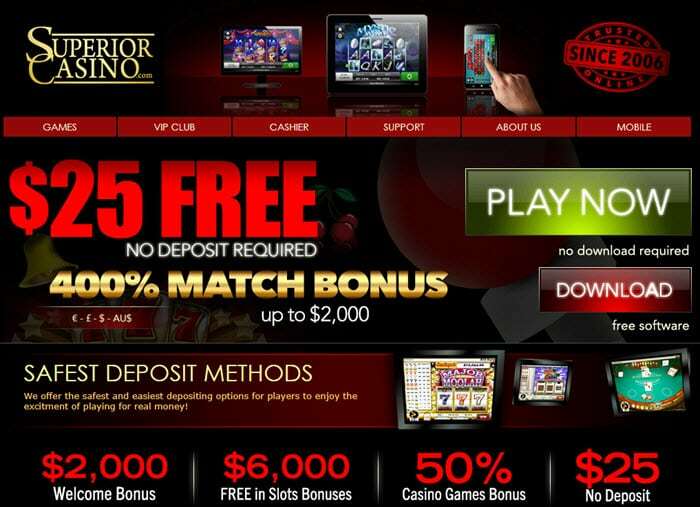 Superior Casino no Deposit Codes 2019 - Get $25 Free! Launched in 2006, Superior Casino has a lot to offer, delivering a fantastic array of games, generous incentives, easy navigation, knowledgeable member support, and huge wins to members of all levels. Offering the best of three worlds of gambling, the casino offers downloadable, mobile, and instant-play versions of its games, which are powered by Betsoft and Rival. The site is displayed in multiple languages, including French, English, Italian, and Spanish, delivering a superior level of convenience for players from around the world. Deposit Methods: CLICK2PAY, Ukash, Skrill, Neteller, MasterCard, EcoPayz, ClickandBuy, Visa, and Paysafe Card. 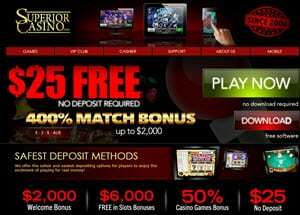 Superior Casino play now ! Superior Casino keeps its members happy by providing a full selection of games, ranging from classic titles to modern versions. Games are powered by Rival and Betsoft. If you enjoy watching spinning reels in anticipation of landing a few bonus features, you need to check out the casino's supply of 3D slots. Exciting titles are waiting for you, including Sherwood Forest Fortunes, After Night Falls, 2 Million BC, A Night in Paris, At the Copa, Arrival, and Alkemors Tower. Dozens of video slots deliver crisp graphics and realistic play. Titles include Wild Carnival, Dog Pound Dollars, Fantasy Fortune, Grandma's Attic, and Metal Detector, just to name a few. The selection of table games runs through all of the usual suspects, including American Roulette, Craps, 5-card Poker, European Roulette, Pai Gow Poker, Baccarat, War, and Blackjack. You won't be disappointed when you visit the page for video poker. This collection features all of the familiar games, including Aces and Faces, Deuces Wild, Double Joker, and Jacks or Better. You'll find single-hand options as well as multi-handed versions. Live games are offered 24 hours a day. Just launch the live casino and see what's available. Live dealers keep the excitement going all day and night. Once you get bored with the regular listing of games, you can browse the selection of specialty games. It might be small, but it does include popular versions such as Sudoku and Keno. Mobile games are just as much fun as the downloadable ones you get on your computer. Just open an optimized browser, download the casino software, and begin to play. Lots of bonuses are available at Superior Casino, particularly for new members. Designed for players who absolutely love to get something for nothing, the $20 Free No Deposit Bonus puts $20 into your account just for signing up. No deposit needed to claim your money, but you do need to meet the 20x wagering requirement before you can withdraw your winnings. Designed with new members in mind, the 100% Match Bonus offers players a 100% match on their initial deposit up to a value of $1000. You do need to complete a 15x wagering requirement, and it is only good on certain games. If you have a lot of friends who love to gamble, this is the bonus for you. Each time you refer a friend who joins, you get $50. Membership into the loyalty club begins as soon as you join Superior Casino. Rewards include free chips, surprise tokens, raffle invitations, cash-back bonuses, and more. Superior Casino's gambling operations are overseen by the government of Curacao. While few people actually know what's involved with this type of regulation, it is legitimate as well as standard for this aspect of the entertainment industry. The site's games are powered by two big-time players – Rival and Betsoft. If you are familiar with games from these software giants, you'll easily recognize the crisp graphics, clear audio, and seamless game play. Keeping a player's financial information safe is important to the owners of Superior Casino. SSL encryption is used to ensure important details are safeguarded and secure. Ensuring the games deliver random results is essential. A random number generator is utilized to provide fairness in all of the casino's games. Deposit options include CLICK2PAY, Ukash, Skrill, Neteller, MasterCard, EcoPayz, ClickandBuy, Visa, and Paysafe Card. Withdrawals can be made using CLICK2PAY, Ukash, ECO Card, Skrill, Neteller, Visa, and Visa Electron. When you need answers, you probably want them as soon as possible. 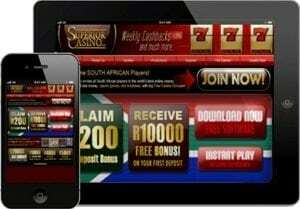 Superior Casino makes that possible by offering 24-hour access to its live chat facility. If you don't want to stop gambling just to get an answer, you can also use email to pose your question. Players from a wide collection of countries cannot join this website. The full list can be seen on the Superior Casino website, and the following countries are in that list: Estonia, Bulgaria, Romania, Denmark, Netherlands Antilles, Costa Rica, Poland, Hungary, and Singapore.